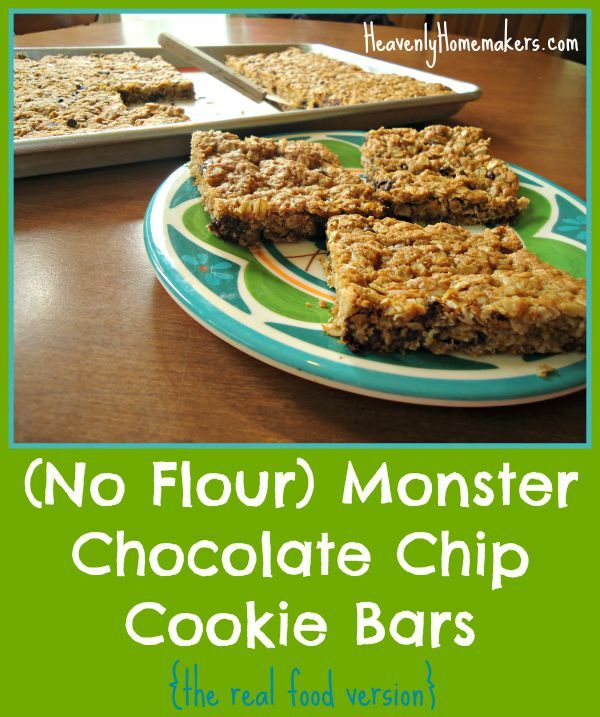 Monster Chocolate Chip Cookie Bars – come and get ’em! When I saw the original recipe for these bars here, what really jumped out at me was the “no flour” thing. Avoiding flour is always a nice option in recipes. I also noticed the “mini m&m” thing but decided that while those are fun and tasty, they are on the naughty list and not required to make these cookie bars good. Then I wondered if I could cut back on the 2 cups of sugar and the amount of chocolate chips. Do I know how to ruin a good recipe, or what? Hey. I didn’t ruin a thing. I simply cut back on the sugar and cut out the corn syrup and 10 different food dyes. The cookie bars are still delicious, so says my family and several other people I have served these to who didn’t even know I’d healthified this recipe. It probably helps that these bars still have plenty of sugar in them. 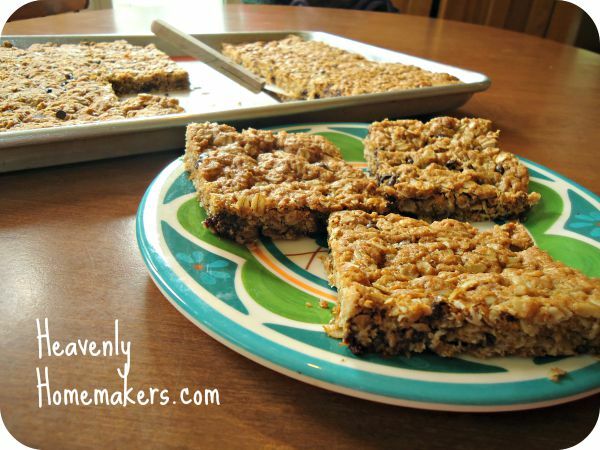 The oats and lack of flour create a really fun, chewy bar. I say, make these then wrap them individually and freeze them to grab out for lunch boxes or on-the-go snacks. This makes 24 good sized bars. Cream sugar, butter, and peanut butter together until smooth. Add eggs, vanilla, and baking soda and mix well. Stir in oats until well combined. Spread mixture into a cookie sheet lined by parchment paper. Bake in a 350° oven for 18-20 minutes or until lightly browned. Makes 24-36 cookie bars, depending on how large you cut them. Make these gluten free by using GF oats. Learn to make your own Quick Oats here. Enjoy this very easy treat! These look delicious! I there just might be a need for special dessert at dinner tonight. Any ideas on a way to make these without the egg? I’ve been loving the no bake cookie recipes you’ve been posting as I recently have had to start avoiding gluten, egg and almonds. Terrible combination of you live to bake! thank you! No, but I really hope to find out because I have a new friend who can’t eat eggs! Hi! I’ve used flax eggs successfully in numerous recipes. Just add 3 T water to 1 T ground flax seed. Mix it really well, then for best results refrigerate for at least 15 minutes. It’ll thicken up. Stir it a bit again, then just add to whatever you’re baking. Does anybody know of a sub for the peanut butter that isn’t another nut or sunbutter? I’m allergic to all of those, unfortunately. Do you have a good source for mini-chocolate chips? They are hard to find. There are different sizes of cookie sheets. Could you tell me what size you use for this recipe? I used what would be called a “half sheet” which is 16 1/2×11 5/8 on the interior. I asked my 13yo to make these for us. And surprisingly she did lol! They’re great! And plenty sweet – I don’t know why my sugar would be needed. Hi! I love your version. They look yummy! Healthier is always better. Although, I don’t think my kids would let me get away with no mini m&m’s :) I think next time I make these, I may try your idea of cutting the sugar in half. I am sure they would still be plenty sweet. So happy to have found your blog. Newest follower. Have a great weekend! I love this recipe and make it all the time! I just tried a new version where I replaced the peanut butter with pumpkin and the chocolate chips with dried cranberries and pecans. It turned out great. We eat it for breakfast :) thanks for the great recipe! !